MOCAP's TWF plug cap features a thicker and wider flange which is easier to handle and prevents plug from pushing through the opening. MOCAP Thick Wide Flange Plug Cap meets aircraft, aerospace and defense industry standards. Our TWF tapered plug caps are molded in high visibility yellow polyethylene plastic and stocked in sizes to plug holes from 0.125" through 6.620" and to cap parts from 0.060" through 6.630" diameters. Recommended to use for tube and hydraulic fittings, tube end cap, pipe caps, or product protection. MOCAP stocks Thick Wide Flange Tapered Plug Caps in many sizes for immediate shipment. 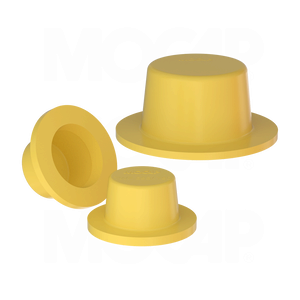 MOCAP's Plastic Plug Cap has a tapered design which allows it to be used as a cap for multiple threaded and non-threaded applications. Use our Tapered Plug Cap to plug a wide range of openings, including threaded and non-threaded holes, pipe and tube ends, connector ports and fittings. MOCAP Plug Caps can also be used as inexpensive, single-use disposable masking products for painting, coating and spraying processes up to 175°F (79°C).